Maryland Pink and Green: What stop sign? Believe it or not, living in a foreign country prepares you for life in the United States and provides incredible life experiences that you can read about here. Driving in Mexico is one such experience. 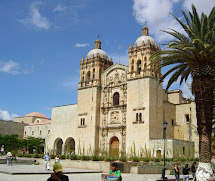 Living in Mexico really refined my driving (and negotiating) skills to an art, although it did take some time for me to learn the nuances of driving in Mexico. Distracted drivers wouldn’t last one day here. Same goes for people who are afraid of merging into traffic. In a city of almost 20 million people, there is no time for hesitation. 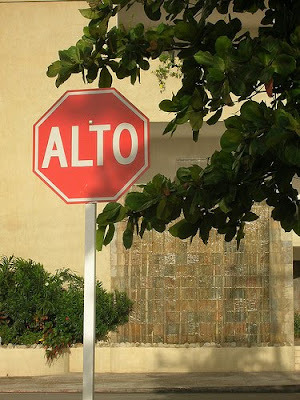 I was also very interested to learn that the red stop signs reading Alto didn’t mean that I had to stop. Sometimes people gently pause or roll through the alto signs, but most of the time, if you don’t see anyone else in the intersection, it’s fair game to keep going in many neighborhoods! One of the most surreal experiences for me was to ride as a passenger in a car whizzing through red lights on Paseo de la Reforma, the main thoroughfare through Mexico City, late one evening. 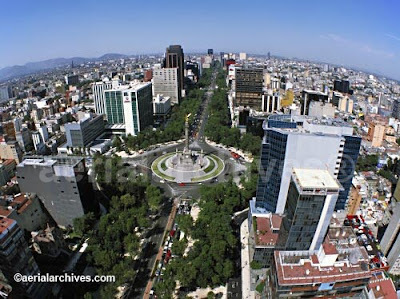 Image of Paseo de la Reforma from www.aerialarchives.com. Knowing when I could and could not run red lights turned into another comical adventure one Saturday morning. It was early in the morning and I wanted to buy gas and get a Reforma newspaper. I had 100 pesos or about $10, just enough to get a little gas and a newspaper. The Polanco neighborhood where I lived was deserted at 8 in the morning, so I decided to run the red light at the intersection of Homero and Newton. Yes, I knew that I shouldn’t have gone through the light… No sooner had I crossed the street into the gas station, and a friendly police officer in brown pulled up beside me in a motorcycle. 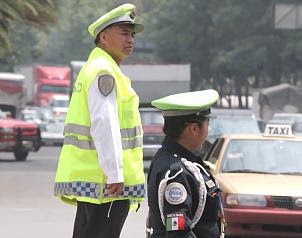 Transit police in Mexico City. Photo from El Universal. We started to discuss the situation at hand. The friendly officer told me that “we” could resolve my error by working together…Long story short, the officer wanted some money for his “lunch and soft drink” to forget about my minor traffic violation. 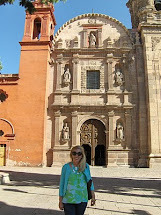 But, I was in a bit of a bind since I only had $100 pesos with me. “NO PROBLEM,” said the officer. He waited while I got gas, accompanied me to my apartment building, waited outside with the doorman while I got my ATM card, and ultimately accompanied me to the ATM machine where I withdrew another $100 pesos for his “lunch!” Easy and inexpensive situation to solve. Keep reading my Mexico stories…many more driving stories to come including bulletproof cars and windows and my super James Bond skills driving course! 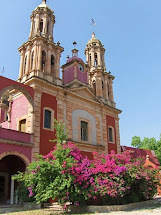 Lots more fresas, food, and vacation stories to come, too! Hope everyone has some good plans for the weekend. It's been very busy here with DAR convention events, my Dad's birthday, and other fun things. I'll post more about later. We're supposed to be a sunny 70 degrees here today. Anytime I have been a passenger in Mexico I get my seat belt on and close my eyes until we get to our destination! Very interesting blog entry! You never disappoint haha. I just started a blog that I think you might like. It combines fashion and giving back to charities. Each week, I will give away 1 Lilly Pulitzer dress (this week it’s the Pink Adelson Shift from Spring 2010) to one lucky follower, who raises awareness of the blog's selected charity through various ways such as tweeting about it or commenting with an interesting fact. I am currently also giving away some great Lilly stationary items too. Please check out my blog at www.shop4charity.blogspot.com because doing good is chic!